Join Us For Open House. First time applying to Herkimer College? No problem. Complete our free online application. Matriculated Students/Degree – Choose this if you plan to study on a part-time or full-time basis, earn a degree or certificate and are interested in applying for financial aid. Non-Matriculated/Non-Degree – choose this if you are interested in taking a few courses on a part-time basis without earning a degree or certificate. Non-matriculated students are not eligible for federal and state financial aid. International Student – Choose this if you are applying as an international student seeking to enroll in a degree program on an F-1 Visa. Click here for more information for international student admissions. *If you are an international student looking to enroll and complete your degree entirely online, then you should complete the Matriculated Students/Degree Application. **A Visa Holder Other Than F1 - You cannot travel with a B1/B2 visa to study in the U.S. According to the regulations, enrolling in classes while in B-1/B-2 status will result in a status violation. If you are already in the U.S. with a different visa other than an F1 visa and would like to study at Herkimer College, you must call 315-574-4005 to make an appointment so that you can speak an advisor to determine your eligibility to study. If you previously attended Herkimer College, you do not need to apply again. Simply complete the Request to Return form. Let us answer your questions and help you learn to apply. What you need to know about paying tuition. 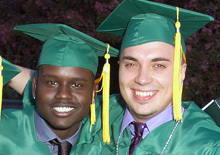 Herkimer College attracts students from all over the world. About 75% of our students receive some form of financial aid. Live on campus and have the complete college experience. We make sure your programs fits you perfectly.